James Koehler was my teacher. He died unexpectedly in March 2011 at the age of 58. I offer this page as a place to find information about him on the web. American Tapestry Alliance’s Tapestry Topics tribute issue, Summer 2011. You can read the issue on the ATA website HERE. Or download it from the button below. James wrote an autobiography not long before he died. You can purchase it HERE. He discusses his upbringing, his time as a Benedictine monk, and his struggles to leave the monastery and forge an identity as a tapestry artist. James Koehler with his book shortly after it came out at a Convergence 2010 book signing. The video below shows James working in his studio. He talks about his process and what tapestry means to him. I remember this video being filmed during my time in the studio, likely in 2009. 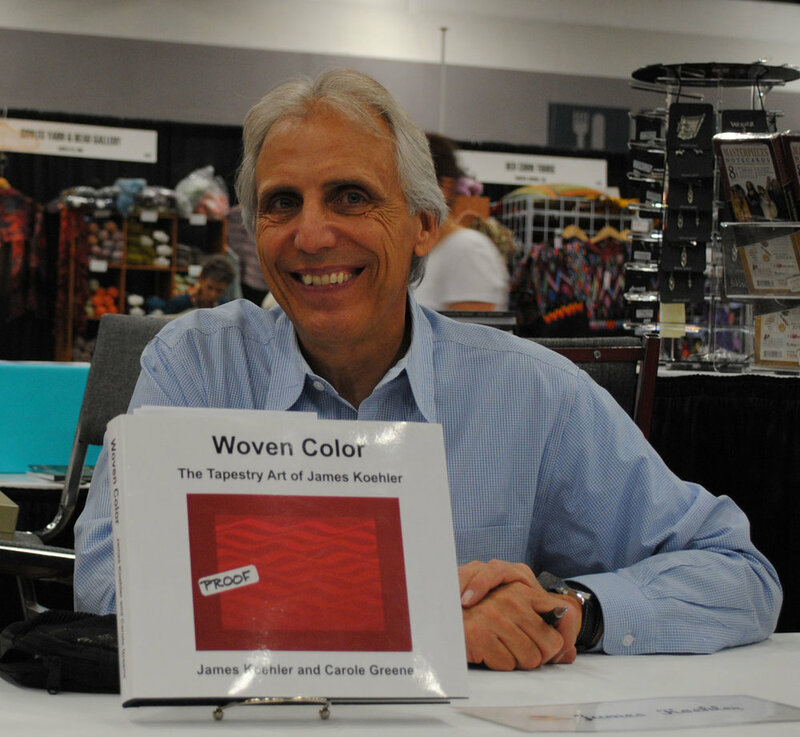 The Denver Art Museum included one of James’ Chief Blanket pieces in their tapestry show Creative Crossroads: The Art of Tapestry, May 2015 to August 2016. This show was curated by Alice Zrebiec. Below are five videos that the museum produced from an interview with myself and Barbara Brophy, another student of James’. I’ve included links to my blog with more images and text about the show and videos. I’ve written many blog posts over the years about my work with James and in memory of him after his death. James loved teaching almost as much as he loved weaving. He was a dedicated teacher who was interested in helping people understand tapestry both one-on-one and in a wider context. Much of my own tapestry practice and what I teach came from what I learned from James. I teach a particular join he taught me that I call the James Koehler join. You can find more teaching videos on my YouTube channel. And I teach techniques I learned from James in my online classes HERE. Once there was a tapestry weaver who didn’t like any of the yarns available to him. James wanted a yarn about the size of a Swedish yarn he liked, Faro, but from a US mill. He had been using Harrisville Designs’ Highland yarn for his teaching and he asked Harrisville if they could make a thinner singles yarn he could use for his own work. They did mill a singles yarn which is now available commercially in white. This is the yarn that I use for my own work and I’m grateful to John Colony for making it available to the wider public in 2018. 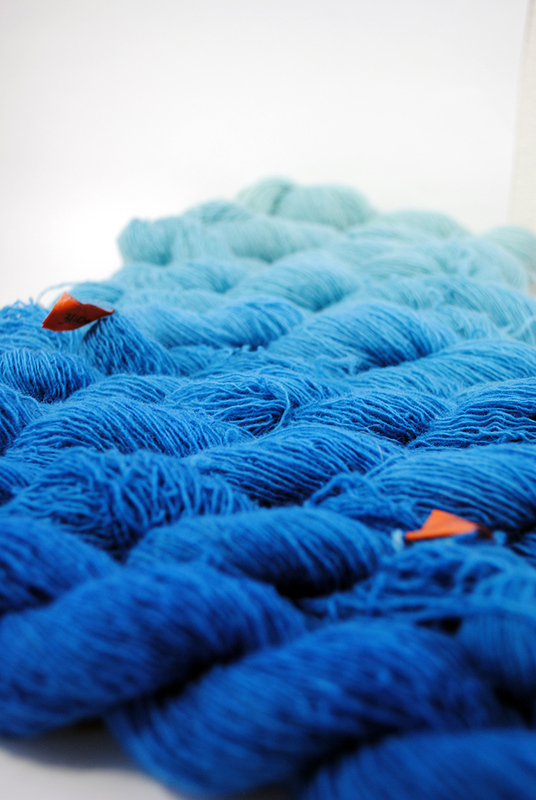 You can order Harrisville’s Koehler Tapestry Yarn HERE. At the end of his life, James went to using Faro. So you may see that particular yarn also referred to with his name from time to time. Syne Mitchell had a podcast called WeaveCast years ago. She had a wonderful interview with James recorded in March of 2010. Listen at the link HERE, or play below.